The smoke alarm sounds whenever there is an unsafe amount of smoke in the motorhome. Always open the roof vent before cooking. Open doors, windows and roof vents to air out motorhome and silence the alarm. Identify and eliminate the source of the smoke. Replace the battery at least once per year, and test the battery after replacement. Remove the cover to replace the battery. Clean and vacuum opening on smoke alarm once a month. Do not remove the battery to silence the alarm. If the alarm “beeps” every minute, the battery is weak and requires replacement. Do not allow the battery to go dead. Use only recommended replacement batteries (see Smoke Detector operator’s manual in Motorhome Information Kit for detailed instructions). Test the smoke alarm before each trip by depressing the test button (1). Test the smoke alarm after removing the motorhome from storage, before each trip and weekly thereafter. 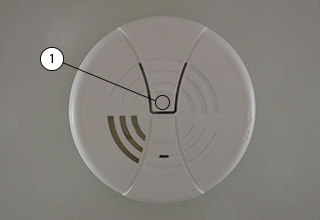 Test the smoke alarm sensor by blowing smoke (from a safe, fire-free source) past the sensor. If the alarm does not sound, identify and correct the source of the problem or replace the smoke alarm. Make sure the wires are properly connected to the device battery. Position and close cover. If you suspect the smoke alarm is not functioning properly, replace the alarm - do NOT attempt to repair it. Smoke alarms are not perfect and do not respond in all situations. The best safeguard is fire prevention.